With CS5 now available the EMEA Evangelism team have been hard at work prepping for our upcoming tour and the Online Developer Week. The course of events will fall between June 7th – 10th covering everything from design in Photoshop CS5 to development, and even deployment of your applications using the Flash Platform suite of tools. The tools covered will include Flash Builder, Flash Professional, Flash Catalyst, Flex 4 and the Flash Player 10.1 and AIR 2 runtimes. In my own session we’ll also be covering Device Central and some asset optimization guidelines for targeting mobile phones. We’ll also look at P2P with Flash Player 10.1 as well as Livecycle, PHP and Java integration on the backend. We’ve been busy for the past week building “EVA” to demonstrate all of the above. I think you’ll be really impressed with it and of course we’ll be providing the code after for you to use in your own applications. The Mobile World Congress is a massive event with some 50,000 attendees from around the world. Each year there are around 50 Adobe employees from across the organization in attendance, including all the key members of the platform team at Adobe. This year we’ve managed to delay a few flights and tweak some schedules to create a fantastic line up for the Spanish Mobile and Devices User Group event “DeviceDays”. Raul, Marcos and myself will be joined by Richard Galvan, Product Manager for Flash Professional, Enrique Duvos who leads Evangelism in EMEA. I’m also really excited to tell you that some of our Open Screen Project partners, and advertising aggregation providers GreyStripe will attend as guests. You’ll get a chance to speak with them directly, and additionally GreyStripe will present on ad-funded applications.. really exciting! Note: Passing security takes time, arrive 15-30 mins early. The event website is here, so start registering. CES 2010 in Las Vegas saw a very interesting device launch from UK based Light Blue Optics. The great news is that they’ve received really positive press and comments from users that are eager to get their hands on the Light Touch. So what is it? Effectively it’s a projector for rich media, but it’s laser based which gives it the ability to project onto different surfaces while maintaining a sharp focus and bright colours. LBO used the Flash Platform to provide a rich user interface engine for applications, games, photos and even H.264 video playback. The device is also multi-touch enabled using infra-red, but employs an invisible grid projection onto the surface, which enables much more accurate and speedy response times. As a user you can envisage a huge array of different use cases, maybe your calendar projected onto your desk, or video playing on your bedroom wall. We saw a huge array of 3D TVs, ever larger, thinner and brighter televisions this year at CES. 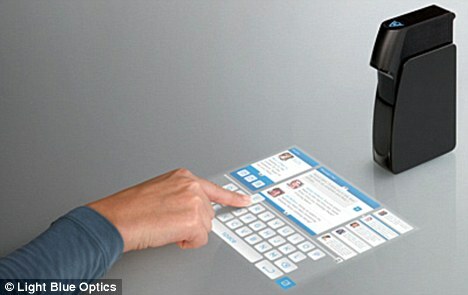 Could the future require no screen at all? Just think of the options for this kind of device in the auto-industry, gaming and entertainment. The great news is that the device spec’s make it capable of running Flash Player 10.1 in the future, reaping the benefits of our consistent Open Screen Project runtime for all platforms. This September I’m going to travel to Toronto to present at the FITC conference. It’s set to be an exciting show with all of the major mobile platforms being supported including Android, Palm, Windows Mobile, Flash Lite, Blackberry, OpenGL ES and of course iPhone development. There’s even going to be a session on SMS Applications, something that is probably a lot more interesting that you’d think! So as you can see there are going to be a number of presentations on Flash topics. In my session I’m going to probably break the rules and just sit and have a chat with everyone. Distribution is a complex topic and one where many misunderstand where money is made. Prices are very low at $209 and $89 for students. This week Adobe’s CEO Shantanu Narayen announced during our earnings call with investors that we will release a beta version of Flash Player 10 for smartphones. Predictably this will happen during Adobe MAX 2009, where mobile will be front and centre. It will be a developer release and for web browsers, this will enable us to collect feedback, fix bugs and give you a chance to get started and speaking with your customers about this new technology. So, like I said in my previous post during the slow summer season it’s a perfect opportunity to begin learning AS3 and Flash Player 10 features. I have already started learning more and more over the past few months, and the good news is that life is much much easier with AS3! As we move through the summer you’ll start to hear more about my experiences as I find out new tips and tricks.